Chollas weren't even on Rebecca Trembula's mind when she set out to visit Southern California--but then she saw them stretching out in front of her in the morning sunlight. A whole valley of yellow-topped teddy bears. She took photo after photo, trying to preserve the moment, the place, and the feeling. 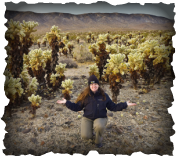 Later, at home, she put the resulting pictures together to weave a glimpse of the life of a cholla. Read it in Cactus Choy: Introducing a Not-So-Cuddly Teddy Bear. This year Spanish was going to be part of the curriculum. You bought some books and CDs and started off with great intention. Somewhere along the way though, the plan got derailed. The books went too fast--or too slow. They were boring...or just fun and games that never got you past being able to say "hola" and count to ten. Bit by bit, you lost track of the plan. Now it's almost Thanksgiving. You don't want to give up, but you aren't sure what to do. You might even be wondering if knowing another language is even worth it. After all, you've survived without knowing Spanish all this time--and it isn't like your kids even have many opportunities to use it. That's where Gobble-Gobble Spanish comes in. It's a one month course focusing on Spanish you'll actually use: words and phrases for telling people thank you, giving thanks, and talking about some things you do every Thanksgiving (if not every day). It comes in bite-sized chunks so you can easily follow along without struggling and the length makes it a manageable project that you will actually stick with until completion. And the reward at the end of the month? Sitting with your family around the table and actually being able to have real conversations in Spanish!